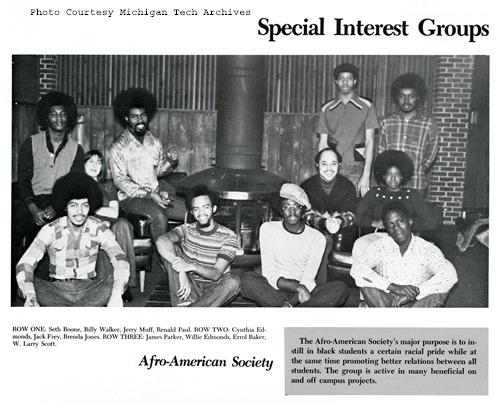 Image of the Michigan Tech Afro-American Society, 1973. 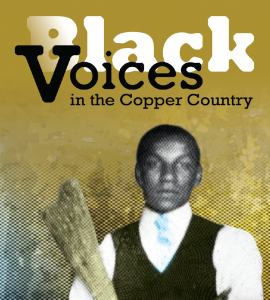 “Black Voices in the Copper Country: Exploring Community and Michigan Tech Campus Life, 1850-1990,” our award-winning exhibit, oral history, and conversation circle project, examines the African-American experience in the Keweenaw, particularly on the Michigan Tech campus. The online exhibit was intended to highlight materials that explore the stories of underrepresented individuals and narratives in Michigan history and serves to encourage researchers to consider more inclusivity when telling regional and state history. The ongoing oral history project and the accompanying discussion groups seek to build awareness about the need for diverse stories in our historical record. The Black Voices project is a multifaceted research initiative that has included substantial archival research, public programming and exhibits. The CDI and the Archives would like to invite you to be part of a critical campus discussion at 4 p.m. Tuesday, Nov. 27 in the University Archives on the garden level of the library. Learn about the project that can serve as a stepping stone to further research and encourage critical investigation to uncover stories and individuals not widely known, but deeply important to the rich heritage of the Copper Country and its unique history. The exhibit will be presented by University Archivist Lindsay Hiltunen and hosted by the Center for Diversity and Inclusion. The Diverse Dialogues series provides opportunities for students, faculty and staff to have conversations about relevant issues of equity, diversity, inclusion, social justice and much more. The conversations are designed to be an informal, yet guided gathering to allow participants to educate and learn from one another. While each dialogue in the series has a centralized theme, we want to encourage participants to determine where the conversations go. This series is meant to start the discussion on difficult topics, elevate the diversity and inclusion efforts and work being done by faculty/staff on campus, and implore individuals to push their awareness, knowledge and action related to themes of diversity and inclusion. For more information about the Diverse Dialogues series or the Michigan Tech Archives, please call (906) 487-2505 or e-mail copper@mtu.edu.